Fits: Models 30, 32, 34, 36, 37, 38, 51, 60, 442, 640, 649, 650, 651, 940, Centennial, Chief Special, etc. 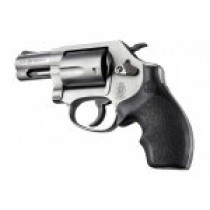 1.4 ounce ultra compact grip that fits flush with the frame for the ultimate concealable grip. Hogue rubber grips are molded from a durable synthetic rubber that is not spongy or tacky, but gives that soft recoil absorbing feel, without effecting accuracy. This modern rubber requires a completely different molding process than ordinary neoprene and results in a much superior grip. The material used does not come apart or deteriorate and is resistant to all solvents and oils used around firearms.